Plants perennial; cespitose. Culms 14-40 cm, erect or decumbent, sometimes rooting at the lower nodes. Sheaths mostly glabrous, with hairs to 3 mm adjacent to the ligule; ligules 0.7-1.3 mm, shortly ciliate; blades to 15 cm long, 2-3 mm wide, with basal hairs, otherwise glabrous or scabrous. 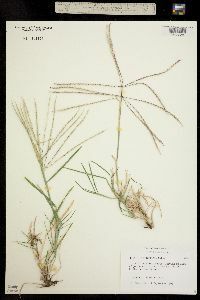 Panicles with 10-16, evidently distinct branches in several well-separate whorls, and a solitary, vertical terminal branch; branches 5-15 cm, spikelet-bearing to the base, with 4-7 spikelets per cm; disarticulation at the uppermost cauline node, panicles falling intact. Spikelets with 1 bisexual and 1 sterile floret. Lower glumes 2-3 mm; upper glumes 2.8-3.5 mm; lowest lemmas 2-3.5 mm long, 1.5-1.9 mm wide, elliptic to lanceolate, keels glabrous or appressed pubescent, sides not conspicuously grooved, margins glabrous or appressed pubescent, acute to obtuse, awned, awns 4.8-9 mm; second florets 1.1-2.3 mm, oblong, somewhat inflated, truncate, not or inconspicuously bilobed, lobes less than 1/5 as long as the lemmas, midveins excurrent, forming 3.2-7 mm awns. Caryopses 1.3-1.5 mm long, about 0.5 mm wide, elliptic. 2n = ca. 28, 40, 63. 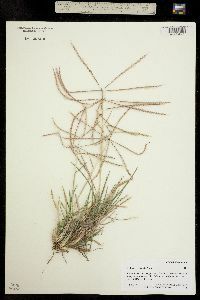 Chloris verticillata is a common weed of roadsides, lawns, and waste areas in the central United States. Prior to disruption of the native vegetation, it grew in low areas of the central prairies. It also grows in northern Mexico. 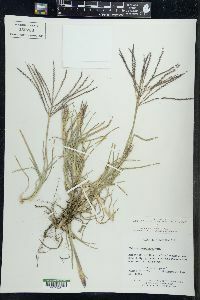 Chloris verticillata hybridizes with both C. cucullata and C. andropogonoides (see discussion under C. andropogonoides). Perennial tufted herb 14 cm - 0.55 m tall Leaves: with a longitudinally ridged sheath that is hairy next to the ligule but otherwise hairless, a ligule that is 0.7 - 1.3 mm long with short hairs along the margin, and a 15 cm long and 2 - 3 mm wide blade that is mostly rough or hairless but hairy near the base. Inflorescence: terminal, branched (panicle), with ten to sixteen branches in whorls along the axis and a single vertical terminal branch. 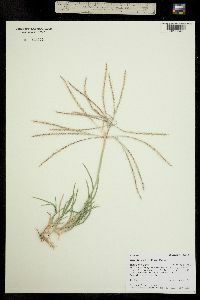 The branches are 5 - 15 cm long with four to seven spikelets per cm. Fruit: an elliptic caryopsis, 1.3 - 1.5 mm long, about 0.5 mm wide. Culm: 14 - 40 cm long, erect or decumbent and sometimes rooting at lower nodes, the internodes having a spongy center (pith). 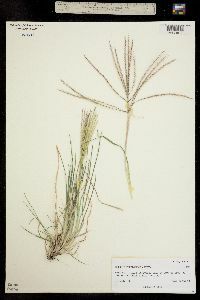 Spikelets: arranged in two rows on one side of a branch, laterally compressed. 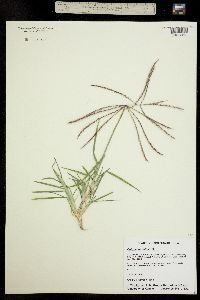 Glumes: unequal, lance-shaped, with the lower glume 2 - 3 mm long and the upper glume 2.8 - 3.5 mm long. Florets: with one bisexual and one sterile floret. The bisexual floret has three anthers. 1.1 - 2.3 mm long, oblong with a squared base and 3.2 - 7 mm long awns, a bit inflated, lobeless or two-lobed, with lobes shorter than one-fifth the length of the lemma. Lemma: of bisexual floret 2 - 3.5 mm long, 1.5 - 1.9 mm wide, elliptic to lance-shaped with a pointed to blunt tip and a 4.8 - 9 mm long awn, hairless or appressed hairy along the longitudinal fold (keel) and margin. The lemma of the sterile floret 1.1 - 2.3 mm long, oblong with a squared base and 3.2 - 7 mm long awns, a bit inflated, lobeless or two-lobed, with lobes shorter than one-fifth the length of the lemma. Palea: of bisexual floret shorter than the lemma, with two rough veins, absent in sterile floret. 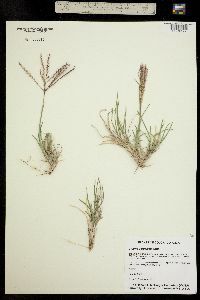 Habitat and ecology: Introduced from the western United States, this species is now fairly common is sandy soils on parkways and along roadsides and railroads. Etymology: Chloris is named after the Greek goddess of flowers. Verticillata means whorled. Densely tufted perennial 1-4 dm, usually erect; lvs chiefly near the base; sheaths compressed; blades obtuse, 2-4 mm wide, usually only 5-15 cm long; spikes numerous, 6-15 cm, eventually widely spreading; glumes lance-subulate, awn-pointed, the first 2-3 mm, the second 3-4 mm; fertile lemma 2.4-2.8 mm, acute, appressed-pilose on the margins and keel, its awn 5-9 mm; sterile lemma wedge-obovate, truncate, 1.5 mm, its awn 3.5-5 mm. Dry prairies and plains; Io. and w. Mo. to Colo., s. to La. and N.M., and locally adventive elsewhere in our range.